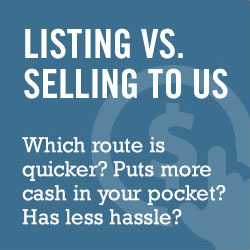 If you’re on this site, we know you want to get rid of your home here in Tucson, AZ – and fast! Either way, you’re ready to sell NOW! But don’t waste time and money by listing your property – it can be a huge hassle with a ton of hoops to jump through, not to mention all the fees you pay. We’re a local group of investors who buy houses, townhomes, condos, duplexes, and even some land. We’ll pay you cash for you home – as is – in as little as seven to 10 days. You don’t have to fix anything or clean up the property! And get this, if you need some time to find a new place, you can live in your home for 30 days rent free after we make the deal – and you’ll have cash in hand to pay for the move. You’re ready to sell your home – so just fill out the form below and we’ll get back to you within 24 hours about how we can help you get out of your home and put some cash in your pocket.